We have been deceived about dog meat. Home / Blog / We have been deceived about dog meat. Below is a translation of article published by Dr. Hong Hae-geol on “After the Rain” medical news. 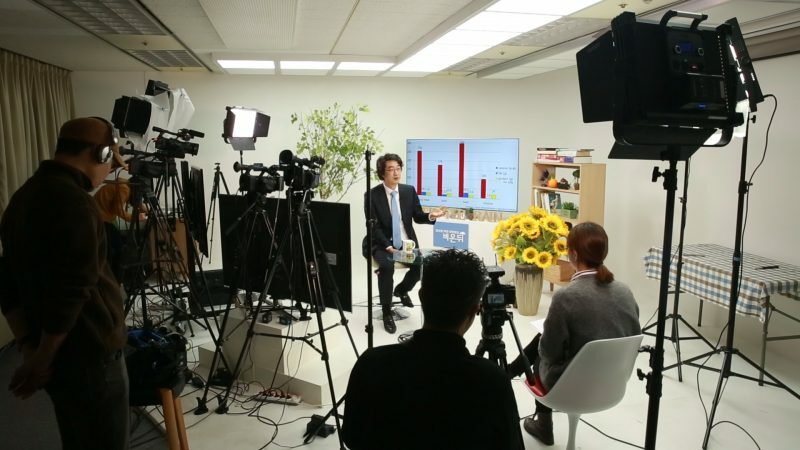 I was recently interviewed by an American TV documentary team for a film called “Hope Project” about Korea’s dog meat industry. The documentary team told me that they plan to meet and collect opinions of consumers, dog meat industry workers, and animal rights activist organizations, as well as a variety of medical, oriental medicine, and veterinary medical experts, environmentalists, and historians. They also told me that they want to offer a broad perspective on the dog meat industry without judgments about morality, and will include social, historical, and cultural viewpoints. Kevin Bright, a well-known producer of the American sitcom “Friends,” is directing and has already visited Korea three times in 2017 to shoot screen footage. The film team asked me about the medical efficacy of dog meat and whether there was any validating objective proof. Up to now, I had minimal knowledge about dog meat, so I looked for material that would allow me to provide responsible answers. Surprisingly, I discovered that there were almost no studies or research on the nutritional analysis of dog meat. A paper titled “A Nutritional Study of Korean Traditional Dogs,” quoted by several people, was written in 1982 by Professor Ryu Byeong-Ho of Busan Industrial College (Kyungsung University). People, therefore, have been making claims about dog meat using a study done 36 years ago. So I kept on looking and luckily found data from the Institute of Agricultural Science. Since this is a government agency we can probably assume the results of this research study can be trusted. The results are shown in the graph below. These results are very different from the common belief we’ve held. Until now, even if most of the media wasn’t directly promoting dog meat consumption, it reported dog meat as at least nutritionally good for your body because, unlike other meats, it is high in protein with low in fat. Nutritionally, dog meat actually has more calories, less protein, and more fat than chicken and especially pork which we’ve been abstaining to help prevent adult diseases. 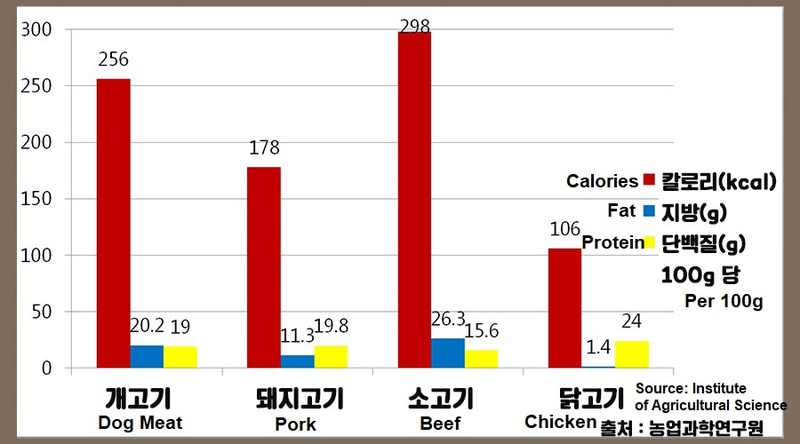 The protein contained in 100g of dog meat is 19g, less than chicken (24g) and pork (19.8g). On the other hand, the amount of fat contained in 100g of dog meat is 20.2g, more than chicken (1.4g) and pork (11.3g). Dog meat is not high in protein and low in fat. Even the experts have been deceived. In a 2002 interview of Dr. Kim Euishin, a prominent oncologist at the MD Anderson Cancer Center in the United States, Dr. Kim recommended dog meat to cancer patients. His recommendation was based on claim that the dog meat was high in protein and a helpful nutritional supplementation for cancer patients. I assumed that even he thought that dog meat contained high protein. But now it’s time to break the dogma. Dog meat is not high-protein low-fat meat. If you want high-protein and low-fat meat, it is better to eat chicken or pork. Do not get me wrong. I am not trying to take the opposition side in the dog meat controversy. I just want to point out that the common belief about dog meat being a high-protein low fat meat, which is one of the important reasons it is promoted as a health food, is false. As a disclosure, I do not eat dog meat. That’s because there is no reason to eat dog meat for the sake of health when there are plenty of other foods. Dog meat does not contain ingredients that help virility like Viagra either. I would like to say that there is no reason to eat dog meat which hurts many people who love dogs like family. Seoul National University Medical School Medical Doctor. Sign Petition: Dr. Euishin Edmund Kim: Stop promoting dog meat as cancer treatment aid and prevention! Dr. Hong is a hero. Thank you for the truth! Stop the dog meat food trade NOW! Nutritious or not is not the issue. All animals have rights (Shopenhauer) and must not be eaten. My particular fury is the assembly line manufacture of meat and other things I won’t go into here. Good for you, Dr. Hong! HORRIFYING AND APPALLING IT JUST SHOWS WHAT KIND OF EVIL PEOPLE YOU ARE!! YOU LACK OF HEART AND BRAINS…..